How do I Reset My Password in MeasureSquare? 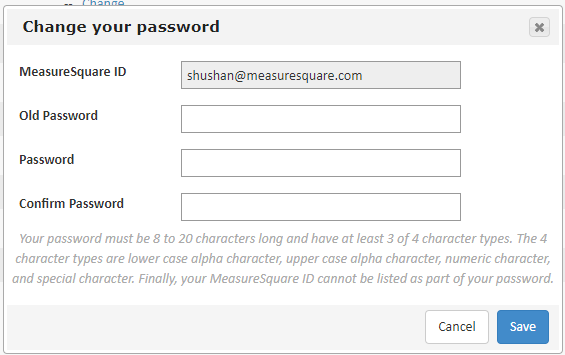 This will explain how to reset your MeasureSquare password for MeasureSquare Mobile and MeasureSquare 8, via the Cloud. Step 1: Go to cloud.measuresquare.com. Step 2: Go to My Settings on the left side -> Click "Change Your Password". Step 3: Fill out your Old Password, New Password, and Repeat New Password information, and click Save.